I am a fan of WordPress. It's a great blogging tool, and it's open source. 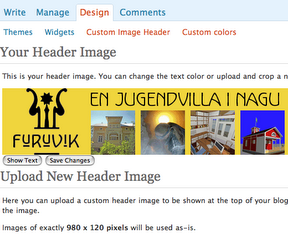 It also has a number of add ons, such as "Themes" whereby banners and colours can be adjusted to personal tastes. Fine. Now, I downloaded and installed the Painter 0.9 theme by the Brasilian web developer Marcelo Mesquita. It enables exactly what I want: The possibility to configure a banner. That banner has a predefined size of 120 px high times 980 px wide, with which I can live just fine. So far, I have designed two banners: one for my Swedish language blog and one for my blog named Furuvik, about an Art Nouveau building I'm renovating in Finland. Next come the unwanted side effects. First, Painter 0.9 introduces hard coded English texts. Normally, WordPress enables the adjustment of most texts (with the exception of dates) so that out-of-context foreign (= English) words don't appear in a normal (e.g. Swedish or Portuguese language) blog. Painter 0.9 introduces the uncustomisable word "News" as a unnecessary header. I'd prefer the header to not even exist, but if it has to be there, then the ugly foreign (= English) word should at least be customisable. The same goes for the word "Home" that appears just below the in the sub header: It's unnecessary, and it's not changeable. Ideally, I would just have changed each of the above seven colours once and not 23 times. Sure, I understand others may want to influence things in more detail. But on the other hand, I left 57-23=34 colours unchanged, and they will likely now pop up when some esoteric combination of events happens, and my colour palette will look ugly. Ideally, also the 34 untouched colours would somehow be derived from the 7 colours I changed. At any rate, from a usability perspective, the colour changing consumes lots of time. And sadly, to some degree the colour changing is mandatory, as the defaults may not fit with the banner. All in all, I am still quite happy with Painter. I understand there is a Painter 1.0, but I don't know which of my above wishes are taken into account in 1.0 so I don't know whether I should spend the time to upgrade. First of all I really appreciate your critics and almost all your suggestions are included on my TODO list for this theme, but will take a while until implement all this..
Now, some things cannot be change, like the huge colors list. That color definitions was made with a WebDesigner help, the first version of the Painter had only four colors then move to sixteen and keep increasing until satisfy all possibilities. I understand that are too many, but as you say "others may want to influence things in more detail". I am sorry for the hard coded english and I like the idea of customize the header text, maybe even let the user define if they gonna appear or not. The date languages are based on .po file, but can be better give this control to users too. I don't understood when you said "I’d like to determine the order of the areas in the sidebar", if you talking about the widgets, they are draggable at the backend. @Marcelo -- Wow, thanks for a very quick response! And a helpful one. Yes indeed, I meant the order of the widgets. I didn't realise they're draggable! They are! Done. "Let the user decide if they appear or not", good idea.